My start weight was 222 pounds on November 3, 2011. Today's weight is 185.0 pounds. I was so amazed that I had round numbers on my 3 month anniversary that I took pictures of my scale. The yellow line is my target line. To lose 60- pounds in 6 months, I've got to stay below the line. The red line above is a trend line, which is less stressful to look at than the actual jagged progress bubbles below it. The red line starts low on my chart as a reminder that I used to weigh 209 pounds the first time I tried—and failed—to diet. But I failed myself. I stopped tracking. I stopped trying. 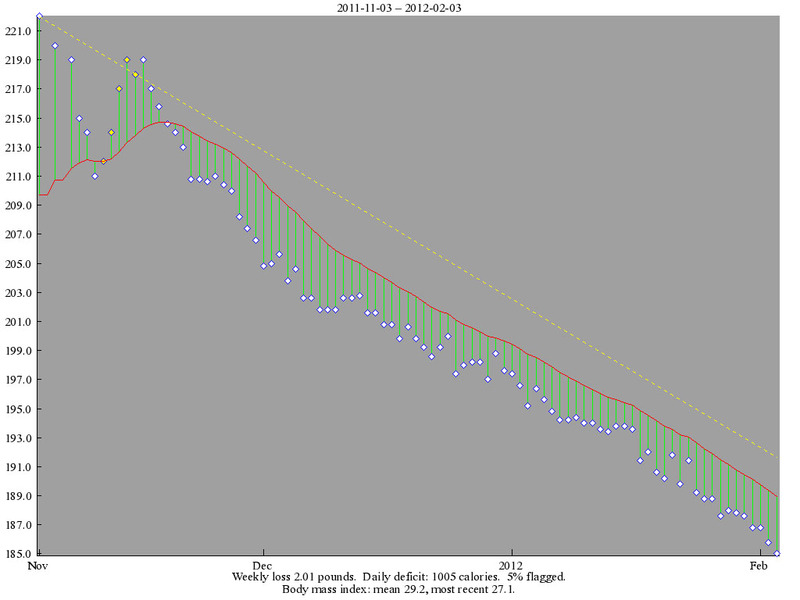 Two years later, I tried again and as my weight loss began the trend line leveled at 215, then has dropped ever since. Using an online calorie tracking service helps tremendously. I use MyFitnessPal, which offers a great mobile app, too. Weight loss is not linear, but there's regular downward progress if you stay committed to the calorie counting regimen. Daily fluctuations can be due to many things, but if you've been sticking to your calorie target more often than not an upward spike is caused by excess sodium. More than 2500 mg a day of sodium will cause water retention, and it is remarkably easy to double or triple this amount through normal eating, especially if you eat in restaurants or drive-thrus. MyFitnessPal allows you to define which nutrient columns you see in your food diary. Turn on the sodium column, and watch it throughout the day. Find low sodium snacks you enjoy. My favourite is roasted unsalted almonds. Sodium levels return to normal 24-48 hours after your start eating the recommended amount. 8+ glasses of water a day helps with this. Pure calorie counting can be enough to lose weight, provided you're patient. Apparently, my impatience trumps my laziness, because I exercise daily. I didn't go into this experience at maximum intensity. I started with calorie counting, then added exercise in the second month, then tried to improve my overall nutrition in the third month. Reading is the unsung ally of weight loss. You can't expect to master your body without fully understanding how metabolism works. Social support is essential, which is why programs like Weight Watchers work. Online programs offer this too for free (via advertisements on the site). Log everything you eat, honestly. If you search the food database for 'chocolate chunk cookie' and several pop up, choose the average calorie one, not the low one. By cheating on your calorie estimates, you're only cheating yourself. Log your exercise, whatever it is. Systems like MyFitnessPal estimate your calorie requirements based on your job and no exercise. Any extra walking, swimming, sports, etc. expend calories, and the system needs to know this to adjust your calorie goal for the day. Don't starve yourself. Ever. Eating too few calories is as bad as eating too many. Your body will stop losing weight and try to protect fat if you undereat. Eat back your exercise calories. Eating 2000 calories is meaningless if you do 1000 calories worth of exercise. The 1000 calories still left in your stomach spells "starvation" to your body. If you burn 100 walking, eat 100 back. If you burn 500 running, eat 500 back. Use an app or online tracking service to make this simpler. If you log food and exercise, MyFitnessPal gives you your number of calories remaining to eat. So eat that much. Want to eat more? Exercise more, and log it. Now, you've earned more calories to eat. Currently, I typically eat 2000-2200 calories per day, and exercise 500-700 calories per day to achieve a net intake of 1500 calories. That target of 1500 comes from the app I use. Your target will vary, and will be set for you when you create an account. I'm a lapsed mesomorph. Mesomorphs gain and lose weight easily. Look at the first section of the chart, where my weight initially goes down then surges back up. That's the result of a few days of vacation eating in the States. You may have a harder time losing, but perhaps your body will resist putting it back on too. I benefit tremendously from calorie counting, but have to stick to it rigidly. I exercise 7 days a week, unless something insurmountable happens (I miss about 1 day per month). Without exercise, 37 pounds would have taken much longer to lose. I lift weights. The more muscle you have, the easier it is to burn calories. I use supplements like protein bars and powdered Whey Protein Isolate shakes as meal replacements, and to compensate for my lower protein vegetarian diet. Your experience eating your particular diet may be different. 37lbs. in about 3 months. That's a great achievement=) Yeah it may not be typical, but your efforts shouldn't be discounted. You may be provided with information from this diet, but it was you who worked it. So kudos to your results.